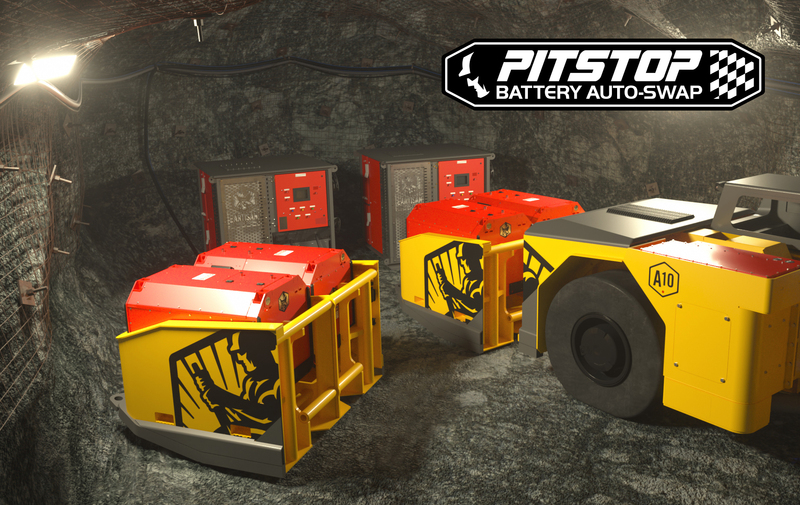 Battery equipment is the future of mining. It exceeds the safety and productivity requirements of underground mining operations with none of the harmful emissions and a fraction of the heat produced by today’s state-of-the-art diesel machines. The biggest complaint about the technology is the perceived downtime for “refueling” or charging. The options for fast refueling are to either quick charge or swap batteries completely. Quick charging produces exorbitant amounts of heat and requires massive electrical infrastructure to achieve even a 15-minute rate of charge for 60-80% of battery energy. Swapping achieves 350kWh of energy delivery in ~8min. That’s an effective charge rate of 2.6MW with none of the infrastructure and heat generated. There’s no question that swapping is the fastest way to refuel a battery machine, but there are some drawbacks. Nearly all swapping-capable battery vehicles in use today require a gantry crane to lift and lower batteries during a swap. This adds costly infrastructure and requires operators to handle a suspended load. We set out to eliminate these drawbacks to make swapping easier and less costly than even diesel refueling. Our solution is the fastest battery swapping method in the industry. First introduced in our Z40 Haul Truck, this built-in mechanism lifts and drops off the battery cage reducing battery swapping time by 50% and eliminating the need for a gantry crane in the charging bay. 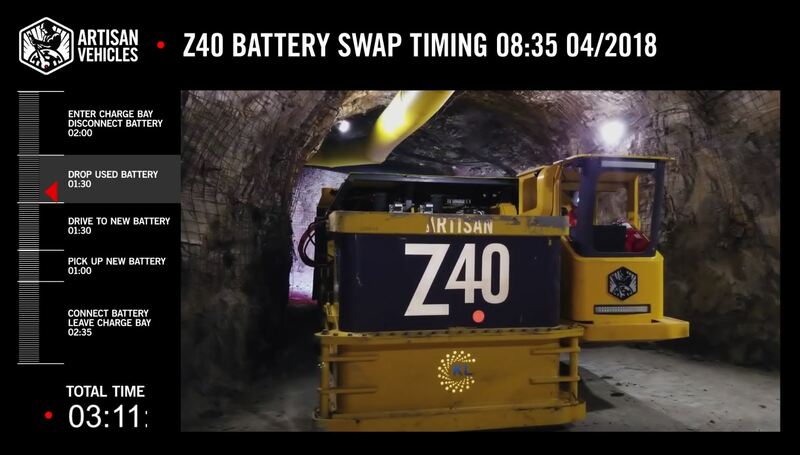 The Z40 Haul Truck can pull in, swap its battery, and exit the bay fully recharged in about 8 to 9 minutes. Times as low as 7 minutes have been achieved by experienced operators working at a comfortable pace. The Z40 battery-swapping operation currently requires a physical operator. However, the all-new A10 LHD will have the option to include our latest innovation called “Pitstop”–featuring the ability to automatically drop off and pick up a fresh battery in just a couple of minutes. The A10 will use AI and camera systems to guide itself into a charging bay, executing the entire swap hands-free for maximum efficiency in just a couple of minutes. Battery swapping will have next to zero impact on cycle times. Pitstop will eventually be available on all of our machines and it is just the latest example of the industry-leading technology that Artisan Vehicles is driving forward.